CalWind Resources owns and operates a wind farm in Tehachapi, California. The wind farm has been in operation for many years, but with the new requirement to report data to the California ISO, CalWind Resources needed to procure and install new measurement and communication equipment. 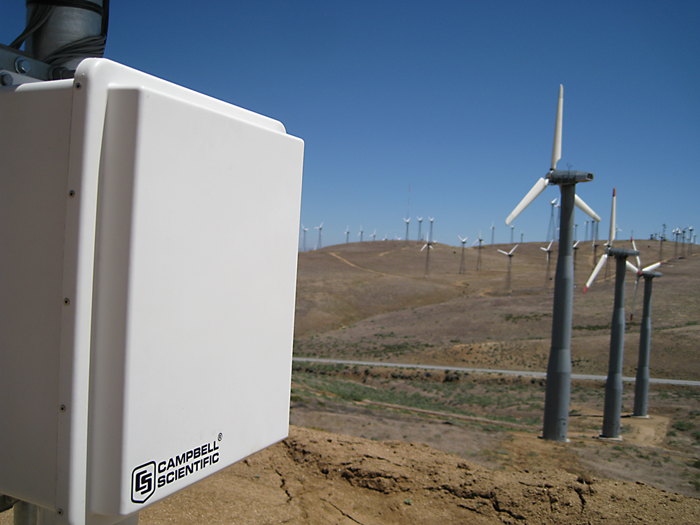 Campbell Scientific equipment was chosen to be installed on the wind farm in order to meet the measurement and communication needs. The California Independent System Operator (ISO) operates the wholesale power system in California, with the goal of providing higher transmission reliability while controlling costs. The California ISO acts as a key platform to achieve California’s clean-energy goals. In order to meet its goals and manage the power grid, the California ISO requires renewable-energy generating facilities to report secure, real-time weather and power data. Typically, a remote intelligent gateway (RIG) serves as the primary means for secure communication between generating facilities and the California ISO’s energy management system (EMS). For the weather data measurements, a weather station based on a Campbell CR800 datalogger was installed on a permanent meteorological tower, measuring wind speed and direction at two heights, as well as temperature, relative humidity, and barometric pressure. A power meter located at a separate location on the wind farm is used to measure voltage, megawatts, and megaVARs. Data from both the weather station and power meter are reported to the RIG, which acts as a data accumulator and is the device that the California ISO communicates with to gather all weather and power data from the site. A CR1000 and NL200 are used to provide the RIG solution. The CR1000 gathers the data from both the weather station via the PakBus protocol and power meter via the DNP3 protocol. The NL200 is used as a secure proxy server to provide secure DNP3 communications with the California ISO. Due to site constraints, a wireless IP network was implemented using IP radios to accomplish communications between the RIG, the weather station, and the power meter.